On Tuesday, Julie Harper who was sentenced to 40-years to life in prison for shooting and killing her husband Jason in 2012, spoke out from behind bars. 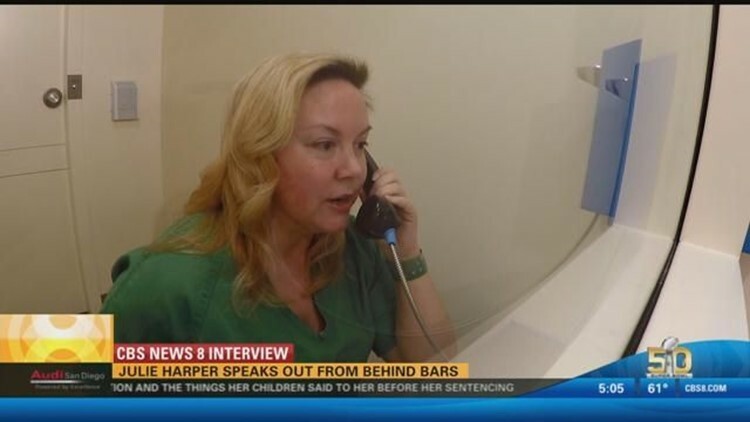 SAN DIEGO (CBS 8) - Julie Harper, who was sentenced to 40 years to life in prison for shooting and killing her husband Jason in 2012, spoke to CBS News 8 from behind bars Tuesday. Harper talked about her husband and how she now wants to be an advocate for victims of domestic violence. When asked if there was anything she would have done differently on the day of the shooting, Harper responded: "between the fear and the shock, I don't think it's fair to say there’s something I could’ve done. It just doesn’t work that way.". The 42-year-old said she endured years of abuse at the hands of her husband for the sake of her three children. “I was just really hurt. They could not look beyond the narrow bit of education they had be able to see from my point of view what things were like,” she said. “To hear the changes that have on with my children is extremely painful. I love them so much. I look forward to someday trying to connect and re-establish a relationship,” explained Harper. As for her husband Jason, Harper blames him for where she is today. “I certainly wish he had not acted the way he did. Both over time and on that day,” she said. Though she is behind bars, Harper said she wants to work with domestic violence victims to become an advocate for them. “I plan to start the Julie Harper Foundation. I’m also planning to write a memoir for my children. It may not be published until after my third trial to try to let them hear the whole story,” she added. Currently, Harper is working on an appeal, which she believes will be successful.